We are on our way out the door to celebrate our sweet Ashley Kate's upcoming 3rd birthday. I get chills when I type that! The next to time you hear from us we will have celebrated with the members of our family and a few close friends. We will have taken them all through the Peppermint Forest, over the Gumdrop Mountains, and across Snow Flake Lake to King Kandy's Castle. I can hardly wait! I hope you all enjoy your upcoming weekend and I hope yours is filled with sweet memories too. I can't wait to show you what we have planned for our Ashley. The guests ages will range from 1year to 63years and I can bet you that the "older" guests will have just as much fun as the "younger". We are headed out to Canton this morning in search of our back pack vendor. I wanted to let you know that I wish I could get all of the back packs ordered but will not be able to. If you did not e-mail me or make payment arrangements with me then I will not be able to pick up your back pack today. I had hoped to hear from everyone who said they had wanted one, but since I did not I just don't have the funds to pay for 30 or so back packs that are personalized. If you did send a check and if it just didn't arrive yet then I plan on getting the contact information while I am there today and I will be happy to still order for you once your check arrives. Several of you have spoken to me through e-mail and we have made "personal arrangements" and so this post won't apply to you if you know that we have discussed your order and payment. Pam, I will pick up Mallory's bag today. I tired to send you an e-mail but for some reason its not going through. Hope you have a blessed day and I hope the vendor is in the same place they were last month! Its true. There is no getting around it. There are days when life hurts and it seems as though the hurt will never end. Tonight my heart is so burden for two sweet children, two amazing mommies, and two separated daddy's who walk the path that we too have walked. I do not know these families, but yet I do. I have never met them, but yet I feel as though we are connected. I read their words and my heart cries out , "I understand". I have never felt such pain as I have felt as I sat at the bedside of my sweet Ashley Kate and begged our Father to have mercy on her and to give her yet another breath, another moment, another day. It hurts beyond description as your heart pleads with the God of the universe and your eyes cry rivers of tears over the suffering of your child. My only comfort during those moments was the knowledge that He was there hearing my every word and collecting my every tear. Knowing that as my heart broke over the suffering of my child He understood because He too had suffered a broken heart over the suffering of His own. I want to be an encouragement. I want to say to these precious hurting families that it will turn around and it will get better, but I hesitate because I don't know that it will. I can't promise them that they will leave those PICU's with their babies. I can't tell them that I will never return with mine. The truth is that I have cried rivers of tears over the loss of my friends children as I begged God for the life of mine. What do you say to a mommy who is tired, who is hurt, who is discouraged, who is desperate to hold and to help their child? All I know to say is, " I am praying. You don't know me, but I am praying for you, your child, your family. I care and I KNOW that He does too." Ash and I just walked in the door and things went well. It was a very LONG day that began at 4 this morning. The surgeon was pleased and told me her bleeding was minimal. He made to incisions(small ones) and stitched them up just to be careful. She is bruised and sore, still a little groggy, and HUNGRY. I love that last word. She is sitting in her chair eating a late lunch/early dinner and my heart is blessed to see that she finally understands what hunger is and that she is willing to open her little mouth and fix it. The worst part of the day was definitely the IV attempts. She is bruised every where! They did the best they could with what she has to work with, but it still hurts and breaks our hearts for her. Once she woke up in recovery she decided to pull the IV out herself and I just smiled knowing that thats her style. She decides when enough is enough and always has(remember how many of her central lines and chest tubes she removed on her own last year?). My heart is blessed to know that she made it through without complication and that we will be able to follow our plans to travel this weekend. We get to put the whole blood clot/coumidin issue behind us and move into her 3rd year without a central line. God is so good! Last year as she turned 2 I had no idea that we would have end up literally fighting for her life on two more occasions, but we did and He was so faithful to bring her through again and again. The year held more heartbreak and more happiness than I could have ever guessed. What a journey. Thank you so very much for lifting her up in prayer this morning. Your prayers mean more than you will ever know. Again, your continued presence in our lives through Ash's story and this journal are a blessing. I really appreciate each and every one of you. I'm convinced that she does. She always knows. She is so restless tonight. Absolutely not herself. Last night she and I didn't close our eyes until after 3:30. I'm so tired and really nervous. She's so tired and more restless than I have seen in a very, very long time. Her surgery is second on the schedule tomorrow morning. That means we check in at 6:30a.m. We will be leaving our house about 5 a.m. I need to stay up for one more hour so I can stop her feeds at midnight and then I'm going to try and get some sleep. The procedure is small. Should be quick and no big deal. The only issue is the bleeding. Her clotting factors are still out of whack because of her coumidin. She's been on it for 5 months and because of this they want to remove the line in the OR rather than the office. My main concern is the ventilator. Her history with intubation is long and ugly. Once I see her in recovery and know that she is no longer on the vent then all will be well. I just want her to ok.
Back to the whole candy land theme and Ashley's diet. Its really not a big deal. Ash doesn't know what birthdays are. She just doesn't have the ability to understand. She doesn't know what candy is. She's never had it. Yes, I am aware that some bowel transplant kids eat candy and chips and the like. Everybody is different. My job is to take care of Ashley Kate. Thats what I do. I choose to follow the recommendations of her nutritionists. Each family is a little different and thats ok. I don't want Ash to suffer from any unnecessary issues due to my decision to take chances. I'm just not willing to do that. Thats what Dave and I have decided for our family. Doesn't mean its right or wrong. Just what we want to do. It's done! We did it(with a little help from Blake, Allie, Grandma, and Nan). We have successfully built a life sized version of the preschoolers game "Candy Land". It is wonderful, and amazing, and magical! I am so excited! I can't decide which area is my favorite. The peppermint forest looks like something out of the pages of Dr. Seuss. The trees are perfect! Exactly what we wanted. I think Ashley Kate may have a crush on Mr. Mint. Each time she sees him she smiles and claps and reaches out to touch this giant, peppermint clad man. The lollipop woods are so cute! Giant, life sized lollipops and a little fairy named Lolli. I think this may be one of my favorite scenes (if I had to choose). Gramma Nut looks incredible! Dave's mom took on the task of painting her as long as she didn't have to claim the name at the party. Peanut Acres is where she lives and cares for her peanut bushes. They look pretty good too. Lord Licorice stands in the middle of our life sized game board threatening to make you loose your turn if you accidently land on one of his sticky, licorice spots. Snow flake Lake is so magical. It is going to be lined with real cotton candy and you can actually see the patterns on the ice where Queen Frostine has skated. She is a beauty! By far the prettiest of all of our characters. Her dress sparkles with glittery snowflakes. The chocolate swamp is another one of my favorite areas. Dave and Blake created Gloppy. He looks so good! The swamp has the cutest fudge sickles growing in it. They look just like the ones on the game board! The Gumdrop Mountains and Jolly were created by our Allison. He is a funny little creature! Finally at the end of our game you will find King Candy and his castle. Once you make it there you get to enter into the castle where the most wonderful candy "store" awaits. Jars and jars filled with yummy candies and scoops ready to fill up the treat bags of all of our guests. The entire room will be transformed into the game and the guests will actually be their own playing piece. As they travel through Candy Land they will have great adventures in each area and will face an obstacle or two along the way like hunting for peppermints in the forest or tossing rings into Snowflake Lake trying to win one of those freshly made cotton candies. The colors are so beautiful and Ashley has had so much fun playing in the shop and watching it all come to life right before her eyes. We are all so excited we can hardly wait. My sister is making one of her magnificent cake creations. She is incredible! I can't wait to see what she designs for the party. Dave and I will be working to set everything up once we arrive Friday evening and then on Saturday morning we will be making cotton candy and filling a hundred balloons with helium and tying individual bags of gumballs to them. They will be scattered all throughout Candy Land transforming the room into a magical place. Ashley Kate will be pulled along the path in her wagon as we play the game and she will have the opportunity to giggle and play the whole afternoon. Based on her reaction to what she has seen so far I just know her eyes are going to twinkle. What a joy it has been to work together on creating this. My most favorite thing in the world is to make our children's dreams come true and this party is definitely a dream come true. Not only will we be surrounded by the colors and the characters Ashley loves but we will be surrounded by the people she loves. That is the most exciting thing about this whole weekend. I can't believe our baby is going to be three years old. We are so blessed!!! We are still facing a tricky little issue at the hospital on Wednesday morning. We have to make it through this before all the fun begins. The procedure itself should only take about 10 minutes. Its the whole sedation, intubation, and bleeding that makes it tricky. She will require an IV and lab work before the surgeon can touch her and that makes my stomach hurt when I think about it. Hopefully they will find a usable vein quickly and then hopefully her blood will clot once the line is pulled and all will go well. Your prayers for our little pickle would be greatly appreciated. We have to be there by 6:30 that morning so its probably going to be a long day. A little while in recovery and then a few hours in post op, then we should get to go home. Ashley Kate has never had ANY sugar in her diet. She can't and never will. Her intake is limited to only 4 grams per serving. Try finding a food that contains less than 4 grams of sugar per serving. It isn't easy. She has only ever eaten organic foods and probably always will. She has only ever had water to drink. No dairy, no juice, no soda, etc. There will never be a happy meal, a processed meal, a fast food meal for Ash. We need to know where her foods come from and how they were prepared so as to keep her from getting a bug or a virus that could make her very sick. Bowel transplant patients are very sensitive as to what foods they can and can't tolerate. Sugar is not included on their list of possible foods. I have never really discussed her dietary restrictions on the blog because she hasn't really learned to eat yet. Ash doesn't know what candy is and doesn't comprehend what a birthday is, so this party is for fun. Blake and Allie know that she will never be allowed a piece of her birthday cakes, an ice cream cone, a soda, a candy cane, etc. We take her transplant very serious and will never do anything to intentionally jeopardize her grafts. Its just part of transplant life. Ashley Kate loves the bright colors and the characters on the game board. This party is just a celebration in her honor and since she doesn't feel like she is missing out anything we are going to have a blast throwing this party for all of our family and friends as we celebrate her 3 years of life. First and foremost I would like to ask you to please pray for one of our journal readers and her family. She sent me a message sharing with me that her 18 year old son passed away this morning. I won't share names, but I will share my request. Please remember to lift them up in prayer. I know their hearts must be broken as they travel this difficult path. Thank you for loving Him enough to pray for others. Next, the backpack orders. I received many, many orders and that makes me smile that so many of you would take me up on my offer to order them for you. I only received 4 emails that gave me enough information to complete the order and get them back to you. If you have not given me a shipping address, sent your payment, or given me the name you would like embroidered on the backpack could you please e-mail me? I want you to be happy and I will do my very best to grant your requests for specific colors, but I don't have anyway of knowing what the vendor will bring. I am going to list the names of those whom I know exactly what they want and where they would like them sent. The list is much shorter than the order list so if you don't see your name in this post please e-mail the missing information. My e-mail is: ashleysorgans@yahoo.com. If your name is not on the list then I am missing a shipping address, or a name for the backpack. Most of you sent your color preferences. I am still missing many payments. I will not be able to order unless I have your payments. I won't cash your checks until I know that the vendor is there and will fill the order. You can send your checks to our office address: 101B Woodbine Place, Longview, TX, 75601. Again it is my pleasure to order, pick up and ship them to you. We are leaving next Friday so if you could reply promptly I would appreciate it. Some of you have been asking what size Ashley Kate is wearing now. She is in a 3T( I like her clothes to be a little roomy for her ostomy, mickey button and central line. if she didn't have these "extras" she would be a 2T) and a size 5 shoe. She is about 28lbs and 34and1/2 " long. She is growing so quickly and is now permanently on the growth chart. She looks so tall when she is in her stander! She is almost up to Allie's waist! I have lots of great photos I want to share from our trip last week, but unfortunately my computer won't transfer them right now. We are working on the problem and as soon as I figure it out I will post new pictures. I really want you to see her in her bathing suit! She is so cute! I'm off to run errands for more birthday supplies. Queen Frostine and Lord Licorice will be coming to life this weekend and we need more paints. The candy path and the giant size lollipops and gumdrops will be finished as well. We will be out at the pond in the shop all weekend, but I will attempt to post at least once. I might even give you a sneak peek of some of our characters. I'm so excited about this party. Its going to be so much fun! ..."car" go round and round, round and round, round and round. Ash and I accompanied Allison on a road trip to Dallas this afternoon to be picked up by her Aunt and her cousins so that she might attend a birthday party this weekend. As I drove back this evening I glanced in the rear view mirror to see the most amazing smile on the most beautiful almost three year old I know. In that moment I was taken back almost 3 years ago as I glanced in my rear view mirror to see the face and the look of wonder that came across it as I drove that beautiful baby girl to her home for the very first time in her life. It was her first time ever outside the walls of a NICU and the world was so large and she was so small. Her six month old eyes were full of wonder as she looked around and tried to figure out where she was. The tears in my eyes clouded my view of her face in my mirror and my heart screamed with thanksgiving as I prayed the whole drive home. It is unbelievable to me that she is fast approaching 3 years old, and that she is mine. Her reflection is in my rear view mirror and not someone else's. She is still with us. I am humbled beyond words and more than grateful. As I watched her this afternoon she caught sight of me watching and began to roll her little hands "round and round" in order to cue me in that she would like to sing her new favorite song. So I began and the smile on her face grew larger and larger with each verse. "The wheels on the bus go round and round, round and round, round and round", I sang. She rolled her wheels with such happiness that my heart screamed once again with thanksgiving for this child. This amazing child who has changed my heart and my life more than I would have ever imagined. In the early morning hours of our day I lay in our bed listening to her "talk" to herself. She was trying so hard to say something. Anything. I listened as her little tongue and her lips clicked and sputtered and squealed. She wanted to talk so badly and I wanted more than anything to make it possible for her. As she continued to "talk" I began to pray for my child. There are those moments when I am desperate. Desperate to help her with her struggles. Desperate to give her the abilities she does not yet have. I want to hear her speak. I want to see her walk. I want to listen as she talks my ear off about nothing really that important but something that means the world to her. I want to walk along the trail at the park with her tiny hand in mine as she skips and jumps across the cracks. There is nothing in the world that I would not give to make these things possible for Ashley Kate. As I prayed I began to feel convicted. What are the things that He wants for me? Are there things that He so desperately wants to bless me with? What areas in my life does He ache over because I have not yet learned or don't comprehend? How broken my heart is for Ashley Kate. How broken the Father's heart must be for me. What am I struggling with that He wants to change for me if only I would allow. In those moments of realization my heart broke and ached over my own lacking. There are many, many areas of my life and my heart that need "therapy". Still I am learning from this child. From her struggles I continue to see my own. How blessed I am to have her. This tiny example of trust. Of strength. Of innocence. Of joy. She is a gift. A precious gift we have been given and will never be worthy of. God smiled on me the day my phone rang and my heart opened up. He heard my deepest prayer and the cry of my heart and He gave so graciously to our family. For as long as I live I will never be able to say thank you enough. As I type her daddy readies her for bed. Tiny cupcake pjs trimmed in pink gingham have been pulled over her head. He wipes her bangs out of her eyes and kisses her on the forehead. She scrunches up her nose and smiles that smile we love so much. He says, "night, night time" and she shakes her head "no, no" smiling the whole time. He scoops her up in his arms and she rides in the crook of his arm into our bedroom. An image I hope to never forget. We are blessed. Blessed more than I would have ever imagined the day I answered and said, "hello". Life with Ash is just so much fun. I know your all aware of the hard times we go through with her frailty, but when its not hard its just plain FUN! We have laughed more, smiled more, giggled more, and enjoyed life more in the last three years than we ever had before her birth. She radiates a joy and happiness in our home and its absolutely contagious. I find myself smiling all day at this tiny pickle. Last night she had Dave and I laughing at her antics as we tried to fall asleep. She is ornery and stubborn. She is sweet and silly. She is so, so wonderful. I love her so very much. She finds joy in the simplest of things. Tonight she played with a pile of laundry for over an hour. She hummed and giggled at each piece. She tried to dress herself in Allies clothes and wore several pieces as hats for awhile. She would throw them across the floor and then scoot(she just started scooting forward today! Can you believe it?) to where they landed and try them on all over again. I couldn't help but get great joy out of her happiness with that pile of laundry. Her voice is beautiful! Shes not saying words, but she is making lots and lots of verbal sounds. Her only mastered phonetical sound is "b", but she is whispering and grunting and humming and squealing. We are all so thrilled about this. It is one of the best things that has happened in our family. We hare all so encouraged by the sound of her voice. Blake and Allison are so happy and they truly believe that she will be talking some day. Tonight she impressed us by swallowing a few grains of rice at dinner without gagging. I know it sounds like her progress is small, but its the small things that are going to lead her to the big ones. Rice! Ashley has not been able to tolerate any type of texture without vomiting. Ever! To see her swallow those 3 or 4 grains like there was nothing to it was absolutely amazing. She is eating 3 or 4 meals a day and doing so well. She sits and finishes complete servings like a big girl now. Her meals consist of about 70-100 calories each. She is also allowing me to combine several different foods for a meal. She will eat a meat and a vegetable and a fruit. I have had such a wonderful summer watching her with Blake and Al. They spend hours playing with her, encouraging her, holding her, and working with her. What joy I feel as I see her eyes light up while she hangs out with them. They love her so very much and what is even more amazing is that she loves them just as much. We are so blessed. We arrived back to our little yellow house in the early morning hours today and all jumped into our beds as soon as we walked in the door. Our week away was amazing and so refreshing, but there's just a little something special about the way it feels to be home again. Home just feels right to me and its here that we spend my favorite moments together. I often wonder just how good it will feel when we all call Heaven our home? I'm quite sure its going to top the way our little house feels, but for now this is what I know. What an exciting week we had. We spent some time(lots of it actually) on the baseball field, some in the OR of yet another hospital(Dell Childrens in Austin), some at Shlitterbahn, and some on the Guadalupe River. Our Tarheels finished 5th at the National Tournament. Our 61 game season ended with 8 full and exciting games of a possible 11 in the tournament and we couldn't be prouder of our kids. They went into overtime more than once and never lost a game by more than 1 run. We scored more runs than any other team( a total of 81) and played more innings than any other team. We never gave in to an opponent and we played some of the most exciting baseball the National Tournament saw. Like I said we couldn't have been any prouder of them than if we had walked away with the title. Blake earned a spot on the All Tournament Team and it brought tears to his dad's eyes as he was given the honor. He pitched one game, caught in all but a few innings of the remaining games, and played a little second base. He made some amazing plays and made some amazing outs at the plate and on his throws down to second base as the runners attempted to steal. We cheered until we were hoarse. Our last game was almost won by a tag he placed on a runner at second base and in the end even though we all know the game was over with that play the umpire ruled against us and the opponents won by one run. Blake will never forget that play and more importantly he will never forget that the call that is made is the call that we will have to live by. We are so proud of the respect he showed on and off of the field. Ashley Kate kept things exciting as always. I spent my time between innings on the phone with more surgeons than I generally like to speak to. We spent 6 hours in pre-op as we waited to have her central line removed then it was decided not to have it done only to have an emergent call the next morning saying it had to be done. A few hours later it was decided to be too dangerous at this point and so for the rest of the week and this one we are "babying" a very weak central line that is not usable and not to be touched. A scary position to be in especially while traveling on vacation, but one that reminds us of her frailty and the value of each and every moment we are given with her. Eventually all agreed that her clotting factors were not stable enough to remove a central line that is in the sub clavian vein (which sits underneath the collar bone) because there would be no way to apply pressure to the vein to help stop its bleeding. At this time her surgery remains on the schedule for the 30th of July. Other than her messed up line(it actually has an aneurysm in the wall of it), she had a great week. My mom traveled with us allowing Ash to stay comfortable in the RV and allowing us the opportunity to see all of Blake's games. It also gave us time to spend with Blake and Al on the river and at the water parks. Without her help our trip would have been impossible and we are so grateful for the way she loves and takes care of Ash. Life is busy, busy, busy. Blake will have 3 weeks off between ball season's, Al begins Tae Kwon Do tomorrow, and Ashley Kate will be turning 3 in less than 2 weeks. We still have two more characters to bring to life for her birthday party so this weekend will be spent in the shop painting Queen Frostine and Lord Licorice. We are all so excited about her birthday and can't wait to celebrate it with all our family. I need to take her birthday portraits this weekend as well. We are on our way out the door. The Tarheels will all arrive at Nationals sometime throughout the day and we will meet early in the morning for check in then the fun will begin. The guys play hard all year and look forward to this week and we can't believe it is finally here. Blake and his bleach haired buddies look so different! All 10 of our Tarheels took the plunge into a bottle of bleach and came out looking so cool. Most of us moms are still stunned because this is so out of character for our boys. Blake is so serious when it comes to baseball, no messing around, and no dis respecting the game of baseball, the field or your team, but he is pumped about their blond hair and this tournament. Its just so fun watching him with the guys. I promise I'll post a picture of this bleached bunch next week. The girls and I will be tagging along behind them all week long. Dave is going with us for the weekend and then will have to be back in the office for Monday morning through Wednesday. Hopefully our boys will still be in tournament play for Thursday which will bring Dave back to join us. If not then we are considering a jaunt down to Schlitterbaun(?sp) for the remainder of the week. Obviously we would prefer to be playing baseball, so we will just wait and see. Ashley Kate received one of her birthday gifts early so that she might have it available for the week. She got a new wagon complete with shade cover and play tables to hold her fan and her Blue DVD just in case she prefers that rather than a ballgame after watching them all week long. She loves the wagon and has been playing in it for 2 days. Grandma and Graypa are going along with us to help keep her comfortable in the RV during the heat of the day so I can be with Blake at those games. Last night Blake was trying to figure out what therapy equipment could be used inside the RV for the week. He made sure I understood that she couldn't go a WHOLE week without practicing. This made me smile as I listened to him work it all out, how much time he thought he would have to work with her between games and activities, who would have to do this and that when he couldn't. I love that he loves her so very much! So we decided on her ball and wedge mat. So whats a few more? We made it through another day and all of our children are fast asleep. Dave is working on a new lecture series and I am avoiding the remaining loads of laundry and trying to convince myself that tomorrow holds more than enough hours for me to complete them. My bed is sounding much nicer to me at this moment than the laundry that remains to be put away. Oh, how I love home. I love the smell, the feel, the peace that is found inside of it. I love these children. I love their dad and his amazing willingness to give and give and give without end to all of us. Its been a very long but very blessed day. Ash was amazing during therapy. I can't keep from smiling while she works. She continues to excite Ms. Sue and myself as we push her along and encourage her to figure out how to move. She was practicing on her knees for awhile, practicing lifting up into the crawling position, and then practicing getting out of it and sitting down when she got tired. One thing Ash hasn't figured out is that she can control how long she has to stay in one position. She kind of accepts that if she is put there then she must be stuck there. Heaven help us the day that she learns to branch out of this line of thinking. We went to see our surgeon today and set a date for line removal and the end of her coumidin. So Ashley Kate will be having surgery on July 30 to remove the broviac from her chest. So whats a few more scars and another incision? When you look at her tiny chest and abdomen it is very hard to find an area that has not been cut upon. She has more scars than I would have ever imagined and has gone under anesthesia more times than I can keep up with. Although we are used to it, I am afraid you never get used to it. It makes my stomach hurt to think of her going through yet another surgical procedure, but the reality of her life is that there will probably be several more. In the past we have had lines pulled directly from her chest in the doctors office without so much as a little Tylenol to ease the discomfort, but this one is proving to be different. They need to put her under anesthesia and make an incision to remove the cuff on the other end because it is so high and so deep that it will not be able to be pulled through. They are also anticipating more bleeding than usual because of her coumidin and would like her to be asleep as they place the necessary pressure on her chest to control it. The surgeon prefers for her to be sleeping and unaware and in a way I am grateful for his preference. Nervous but grateful. So all in all we have a little more than 2 weeks until we find ourselves without a central line and then the real fun of struggling to find veins that work for lab draws will begin all over again. We anticipate that all will go well and she will be home by the late afternoon on that day. We are planning to travel the next evening to OKC for her 3rd birthday celebration and the doctors feel like she will be fine to travel. Her ultrasounds still showed an occluded right jugular vein that is no longer allowing blood flow, a partially occluded left jugular vein because of the remainder of the blood clot we have been treating, and two beautifully opened sub clavian veins that allow blood flow quite well. I'm concentrating on the beautifully opened veins and counting our blessings for having them. The others are what they are after multiple temporary and semi permanent lines and no amount of worry will reverse the damage that has been caused. I'm sitting here watching my almost 13 year old play "hair bows" with my almost 3 year old and it warms my heart. He has fully irritated his little sister by clipping numerous bows into her hair, but has also made her giggle(along with his mom) as he began clipping them into his own hair just to make her smile. Ash HATES hair bows! I LOVE hair bows. So whats a girl to do? Well, when your less than 3 ft tall and less than 3 years old then you don't really have much of a choice. Mom wins this battle(trust me when I tell you that she wins most of them so I don't feel that bad). In our house if your a girl you wear a bow. Thats the rule. I firmly believe God gave me these little girls to make them look like little girls. Nothing is more frustrating to me than for some one to walk up and ask "how old is "he"?" Are you kidding me? Do you not see the ENORMOUS bow on her head and the pink outfit and the pink stroller and the pink diaper bag? Anyway, I got side tracked. My whole point is that my heart just glows as I watch Blake be a big brother to Ashley Kate. She loves him so much and at this moment she loves him even more because he gave her the bow box to empty(yes, I meant to say box because we have one that is absolutely full of bows for Ashley Kate's little ponytail). For a girl who sure hates to wear them she really does love to throw them all over the family room. What a mess! So, we are waiting on Ms. Sue to arrive for therapy(Ash doesn't know this yet). Then we will be traveling to Schumpert to see our surgeon about Ashley's central line. They called yesterday evening and asked if we would drive over to clinic today. Nor really her or my idea of a good time, but we need to make decisions about the future of this line and the future of her coumidin dosing. We are hopeful that this will be the last week she is on it. Ash gets to do something pretty exciting in our house starting today. She has earned a 10 hour window off of her feeding pump. That allows her to have 5 hours off before her first meal and then she goes on for 2, then off for 5 more before her second meal. At this time she is eating between 70-100 calories each meal and we are hoping to get her to eat more with this window. In addition to this change we get to change her from the elemental Neocate to a toddler formula. All if this is good, good, good. Back to the back packs. Many of you have been interested and in order to keep your orders straight I would appreciate it if you could send me an e-mail and give me the specifics of your choices one more time? It would help me in making sure everyone gets what they ordered and that they are happy. I have no idea of seeing what your e-mail addresses or blog addresses are in the forum that we use to receive your comments so corresponding with you through the blog is difficult. The shipping is expected to be around $5. Several have asked about ordering them for little boys. In my opinion they would look a little feminine, but if you want I will be happy to get them for you anyway. Again I want to say that they are miniature backpacks. Not good for carrying books or school supplies. I will not cash any of your checks until I arrive in Canton and see that they can fill my order. It is getting pretty large so I want to make sure the vendor is able to complete the work for me before your money is cashed. Once I have the back packs then I will come home and deposit your checks. This way your don't need to worry why you haven't seen the check clear until the second week in August. If you have any more questions just e-mail me at www.ashleysorgans@yahoo.com. Hope this helps. Ashley Kate continues to work hard each and every day and as I shared with you last week we are starting to see it pay off. Dave and I sit back and watch her every evening and are amazed at how quickly things are changing. Don't misunderstand me, she's not going to get up and walk across the room anytime soon, but she is making progress and that is a blessing. Last night before bed(please excuse this hair don't. I had just pulled out her ponytail for bed) she gave us all quite a show. I won't show you the many "ugly" faces we captured on film between these photos, but I will show you the final product that ended in a success. She worked for about 30 minutes in this position just trying to figure out what she was supposed to do now that she can hold herself there. She never actually made any forward progress, but to see her hold herself in this crawling position encourages our hearts. She has started bouncing or rocking and that tells me that someday she's going to figure it out. At this time she just looked confused to us. She had been sitting here for a while and just didn't know what else she wanted to do. We encouraged and laughed a lot because of the many looks and "lips" she was giving us as she tried to convince us this was just too hard for her. Eventually she just laughed along with us and accepted the fact that this is the way it was going to be. I love this silly girl who thinks she "can't" figure this stuff out. Good thing we have figured out that she can. We also had a very exciting thing happen yesterday afternoon. Her voice came back. I mean she started making phonetical(sp?) sounds again. As we painted she played and then began saying, "b,b,b,b,b,b,b,b,". Over and over again. It was sweet and beautiful and the best conversation I have had with her in years. It was so exciting! I wanted to give some more detail on the back packs. I am happy to pick them up, but don't want you to be disappointed. They are not standard size back packs. They are minis. This makes them perfect for our feeding pump(we use the Infinity, Light by Zevex) and a few diapers and wipes. The pocket on the front fits the pump perfectly and I just allow the tubing to come out of the side without zipping it closed all the way. There is no pocket to hold the feeding bag itself like in our medical packs, but I have had no trouble with just sitting our bag inside of it. I am planning on sewing in a little hook on the top of the inside to hook the bag on, but for now it is working just fine. It is a little larger than the mini pack sent to us from Zevex. If you are still interested let me know. I don't mind ordering them for those of you who don't need them for feeding pumps, but other than being big enough for a small child's diapers, snacks or treasures I don't think they would really work. They wouldn't work for a school pack. Anyway, I am making a list in my notebook and you may send your checks to the address listed on the side of her journal. Again, it is my pleasure to get them for you. I really hope the vendor comes back next month! If they don't I will quickly return your money. Most of the vendors are regulars and have their own spots in the pavilions. I will do my best. Hope that helps you in deciding what the back packs can be used for. Many have inquired about the backpacks Ash's grandma had done for her this week. I have no idea where the vendor ordered the backpacks(there is no tag inside), but I will be traveling through Canton next month (on our way to Oklahoma to celebrate Ash's birthday) and I know where to have more of them done. I say this in all honesty, it would be my pleasure to have them made for you guys if you would allow me to. The backpacks were $12.95(embroidery included) and you could add the "bling" for an additional $2.00(if your girls are like my Ashley you will definitely want the "bling"). Anyway, if you will just let me know what name you would like, and a color(they had several different to choose from. different patterns and such) and let me know your address then I can have them to you by the beginning of the 2nd week in August. ...walked through the Peppermint Forest? ...climbed over the Gumdrop Mountains? ...swam across the Chocolate Swamp? ...stopped by Grandma Nuts house for for a warm, peanut butter cookie?... slid down the Rainbow Trail? ...and arrived at King Candy's Castle? If not then you have no idea what you will be missing out on at Ashley Kate's 3rd birthday celebration! We spent our holiday weekend hand painting table cloths, life sized character cut outs from the classic children's game Candy land, and planing, planing, planing for the celebration of her lifetime! We had so much fun working together in the shop. We started early each morning and didn't stop until way past our bedtimes(one morning we painted until 2am!). I'm not sure who is more excited Dave and I or Blake and Allie? Ashley Kate is clue less, but we don't care. She just looks at the big characters and smiles and claps. Say the word "pretty" and she giggles. The countdown has begun and as bad as I want to show you the amazing pieces we have designed to put together her life size party game I won't until her birthday. 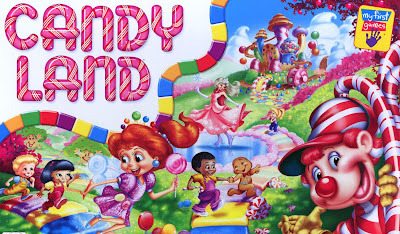 All I know is that if it has been a while since you played a round of Candy Land then let me encourage you to pull one out and let the smile that comes across your face slip into your heart. We have had more fun this weekend then I can even describe. I can't wait for the party! She continued to amaze us over the weekend and each day we grow more and more excited. Every inch might as well be a mile as far as we are concerned. She now pushes herself all over her play area in each direction turning round and round. We put her down on her back for a nap and when we came in to check on her she had rolled over and was on her hands and knees!!! We are so encouraged! Our hearts are happy and grateful and some day soon she might actually figure out how to crawl. I can't wait for the day that I can post about that. We are having some issues with her central line and I am going to try and figure them out before we leave for Blake's National Tournament on Friday. It doesn't want to draw anymore and everybody wants blood this week. I am hoping it is only positional and nothing else. Dave and I want to have it removed as soon as we return from this trip, but it will require her to stay in the hospital for a whole week because of her coumidin. I am hesitant to take her in because I don't want to lose any of the progress she is making. Anyway, just a little bump in our road that I am hoping can be smoothed out soon. Other than that she is doing great and feeling so good. Grandma thought Ash's feeding pump backpack needed to look a little more "Ashley" and so this is what she had done for her today. Put her name on something and add a big bow and it instantly becomes SO "Ashley". She had not one but two(the other one is zebra striped with hot pink embroidery) new backpacks made for Ash today in Canton and I love them. They look SO much better than the standard issue pack sent out by our home health companies. To be honest I never even thought about getting her something other than what we were "supposed" to use. Like I said, you've just gotta love grandmas. Ash sure has a great one! Our hearts have been encouraged. Just when it seems that we have been through some really tough emotional days as we have discussed and tried to figure out where we should go with Ash's future. The conversations between her daddy and I are some of the toughest we have ever had. Lots of tears fall from my eyes and I see his broken heart through his as we face the hard facts of where she is and where she needs to be. I want to live in the land of daisies and rainbows and just continue to be nothing but happy when it comes to Ashley Kate, but we have to be responsible as well and part of that responsibility is being aware of her delays and making plans to help her achieve her full potential. This past week God has blown us away. He has encouraged our hearts and shown us more progress in Ashley Kate's abilities in the last week than we had seen her make in the last year. Each day our excitement grows as we watch her go farther and farther and for the first time I truly feel as though standing and walking may actually be in her future. She has worked so hard and come so far! I realize that when you see these pictures you may wonder why we are so excited about such little things, but if you only knew how hard we have worked and she has worked to get to this place then you would understand our encouraged hears. Blake and Allie wake every day ready to work with Ash and help her practice her new skills more and more. I wish you could peek inside of our home and hear the applause, the praise, and the encouragement that comes from her big brother and big sister's hearts. This is huge! It takes lots of strength for Ash to hold herself here and this is where she was just a few days ago. This was as far as she could go. She has worked so hard at learning to sit on her knees. I was so proud to see her do this. You can see how determined she is and how hard she has to grit her teeth to keep from falling flat. Her little arms get so tired and they shake and shake, but she keeps holding herself up. This little accomplishment led to a huge accomplishment today. You'll see it in just a moment. Oh what joy we felt as she straightened out her little legs and put those tiny feet on the floor! Usually she keeps her legs tightly curled as we lay her across the ball and I have to pry them down and force her to straighten them. Yesterday morning she did this all on her own and we were thrilled! Blake and I were the only ones home working with her at this time so we had to snap a few pictures to prove it to everyone else. Hours after we stopped working with her we were both still smiling ear to ear each time we looked at each other. We couldn't believe it! She's going to be a stander someday we just know it! Blake so desperately wants to help her accomplish this. He understands hard work better than any of us and he encourages Ash over and over again. He is so good and so patient with her. I love to watch him interact with her during this time. Remember the picture of Ash on the red wedge mat? This is what she learned to do by working on that wedge. She can now sit in this position on her own. Position change has been one of the most difficult areas of progressing for Ashley Kate. She is terrified of new positions. Getting her to balance in this one took days and days of practice with that red mat, but look at what she did today! It took 2o minutes of holding herself up on the wedge this afternoon before she trusted herself enough to sit all the way up and then let go of it. She's not happy, but she learned that she can do it. I just love that pouty lip! This skill is so important. Its going to lead to more and more things for her and I am so proud of her. I saved the best for last. Look at what she can do! Do you see her standing? With very little assistance? This was once her daddy made it home, but before this, before she got tired she was standing up straight on her own legs with only my fingers balancing on her hips in case she took a tumble. Blake and I couldn't even speak to each other while she was doing it because we were afraid she would give up if she heard us talking. We were so still and so quiet while she STOOD UP on her own. There was no way to get a picture this time so we waited for her daddy to come home and by then she was a little tired. I have only cried tears of joy this week as I have watched God reach down into our home and encourage a very tired and hurting mommy in the biggest way. He has shown me that He is still at work in her life, still healing her body, still making miracles happen inside of her body. He is still God even when I struggle with the everyday hurts, heartaches, and disappointments. Ash is doing so much this week that I am overwhelmed with her progress. She is eating a full serving of vegetables each day for lunch. She is turning herself in circles on the floor as she plays with all the toys surrounding her. She is pushing herself from room to room in her gait trainer. She is standing for 45 minutes at a time in her stander. She gives her workout a full 2-3 hours at a time. She goes from working in the floor on her mats, to her stander, to her gait trainer and then takes a good 2 hour nap and then wakes and is ready to go again. She blesses me each day. Her pouty lip, her twinkling eyes, her attitude(not always a sweet one), her zest for living each day to the fullest continue to touch my heart. I love this child so very much and to see her learning and making progress, feeling good and being happy is such an answer to prayer. I am overwhelmed this week with thanksgiving. When I pray all I can do is say thank you over and over again. If you only knew how much our hearts have hurt lately and then to see what God has given to her in just a matter of days. I am encouraged.